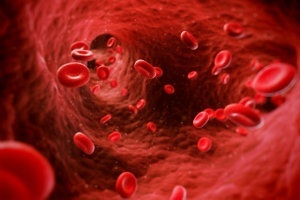 When a major blood vessel is severed, death will occur if the bleeding isn't stopped and circulation restored. This was the case in 1894, when the fifth president of the Third Republic of France, Sadi Carnot, was attacked with a knife in the abdomen that left his portal vein severed. The surgeons who treated the president felt that the vein was too large to be successfully reconnected. Consequently, the vein bled out and the president died as a result of his wounds. This left a deep impression on a young French medical student at the University of Lyon, Alexis Carrel (1873-1944). The assassination spurred Carrel, in 1896, to set out to develop suturing techniques that could be used to reconnect blood vessels and restore circulation. He took sewing lessons from a well-known Lyonnais embroideress and developed manual sewing dexterity. He also adopted her sewing techniques for suturing together two vessels with an end-to-end anastomosis. Carrel’s technique, called "triangulation,” is still in use today, more than a century later. Carrel’s triangulation technique is ingenious in its simplicity. The ends of the two vessels are approximated with three stitches, each placed one-third of the way around the circumference of the vessel. When the stitches are retracted the vessels form a triangle, making continuous suturing possible. This also minimizes the possibility of catching the back wall of the vessel with the needle. Carrel used small, sharp, round needles he found at a wholesale haberdashery not far from his home to sew together the blood vessels. His suture material was silk. He coated both the needles and the sutures with Vaseline, which rubbed off and sealed the puncture from the needle. These precautions prevented injury to the vessel wall, and the formation of blood clots after surgery. Carrol published his first articles on suturing vascular anastomoses in 1902. For this work Carrel was awarded the Nobel Prize for Physiology and Medicine in 1912. His suturing techniques used to reconnect blood vessels and subsequent research laid the groundwork for organ transplantation and heart surgery.